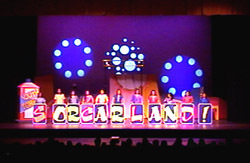 A scene from the SORCARLAND in Manick Sorcar's "Rhythm of 2001"
On September 9, 2001, Sunday, Manick Sorcar mesmerized the City of Denver again, this time with his latest production "Rhythm of 2001", exactly a year after his last mega-show in Denver. 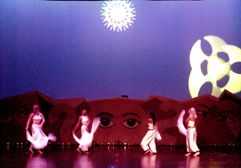 The two-hour program which was an extravaganza of dance-drama in combination with laser animation and state-of-the-art lighting was a super hit. It was shown twice on the same day starting at 1pm and 5pm. 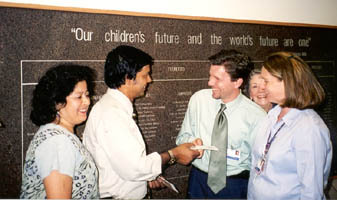 The mammoth production contained more than fifty participants and the motto of the show was "Kids 4 Kids: Working together to raise awareness about child abuse". Two days before the show Manick Sorcar was interviewed, live, by KCNC-TV (Channel 4, CBS) and with his daughter, Payal, by KMGH-TV (Channel 7, ABC), where clips from the past and forthcoming program were also televised. Congratulatory messages surged continuously after the show for several days. In an email message Sudhir Verma, the President of India Association of Colorado wrote to Manick Sorcar "Please accept our heartfelt congratulations on another successful program 'Rhythm Of 2001'. It was a stunning performance by yourself and the whole troupe. All the performers had captivated the audience during the program. You are a rare jewel among the Indian community. Congratulations to your family and to all the participants on their hard labor and putting together a wonderful production." Manick Sorcar's "Rhythm of 2001"
The following excerpt is reproduced from the Entertainment Section of the Philippine/Asian American Times, where the program was reviewed. "Manick Sorcar's Rhythm of 2001"
"It was wonderful! Incredible!" said Lynette Brookman, of Lakewood, "and for a noble cause, too". She liked all the individual shows but her favorites were the "The Under Water Fantasy" and "Sad Eyes" performed by Piya Sorcar which was very touching....Madhu Mahajan of Golden was very enthusiastic about how great the show was especially the "Flames of Fusion" and the "Lamp Dance"..... Milly Madler from Denver said "the excellent production is an art form where children worked with each other". Scenes from Manick Sorcar's "Rhythm of 2001"
We heard more rave comments from the spectators who continued to stay on long after the 1:00 p.m. production. "Manick Sorcar" and "Creative Shows" are synonymous. Each of his shows brings something new, and this year it was no different. Manick Sorcar's "Rhythm of 2001" was one of his best. It was an Indian-American extravaganza with fusion dances, drama, comedy and magic integrated with sophisticated color-laser animation and state-of-the-art lighting that kept the audience spellbound for the entire two hours. 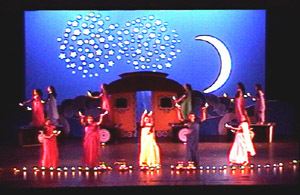 In this show, at the Opening Ceremony, in addition to having laser graphics on a floating screen on the stage, he introduced exciting beam and fan effects to shoot overhead at the auditorium, followed by spectacular moving, patterned lights from intelligent lighting systems throughout the show. An electrical engineer specialized in lighting, an artist, and an animator, Manick skillfully married all three in this latest production. He is also one of the handful laser-animators of the country who uses the monochromatic strong beam of light to race along an artwork to produce a variety of visual effects. But what makes Manick's work different is that he himself is the artist and animator of the complex laser graphics which are specifically designed for the show and he knows how to put them together in sync with live action to produce a spectacular effect such as in the "Dancing With My Soul" - - my favorite. "Dancing with my Soul", presented through SorcarScope (TM), is a magnificent performance by Sorcar's older daughter Piya, where she dances with her soul - a laser-painted animated soul of the dancer brought to life with cutting edge technology. Manick is blessed with a very supportive wife, Shikha and two daughters, Piya and Payal who are the choreographers and main dancers of the production. "Kids 4 Kids: Working together to raise awareness about child abuse" was the motto of the show. The proceeds will be given to the benefit of abused children. Donald Bross, a professor of Pediatrics at the University of Colorado School of Medicine and Director of Education and Legal Counsel for the Kempe Children's Center, spoke during one of the breaks in the show. He spoke of the significance of the program especially in supporting the cause of abused children. Stephanie Stronks Knapp, Co-Director of the Kempe Child Protection Team at the Children's Hospital emphasized the seriousness of crime of child abuse and neglect. Manick Sorcar Productions is proud to announce that on October 2, 2001, 2:30 pm, eighty five percent of the total proceeds was donated to COPSAC (Colorado Professional Society on the Abuse of Children), and on October 3, 2001, 10 am, remaining fifteen percent was donated to the Red Cross for the National Disaster Relief Fund, both in Denver, Colorado, USA. 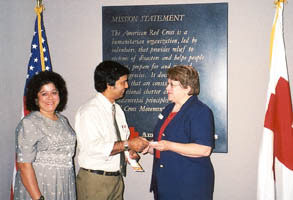 Manick Sorcar with wife Shikha donates proceeds to: Andy Sirotnak, MD, FAAP,the Director of the Kempe Child Protection Team, standing next to Lois Robinson, Secretary, and Stephanie Stronks Knapp,Co-Director of the Kempe Child Protection Team, all with COPSAC.